The Intelajet kit comes with what you see here, ready to install. We also ordered a #21 drill and tap from Thunder Products to mount the nozzle in the aluminum bell of the carburetor. Fuel injection seems to be all the rage right now, but we can’t help but keep our love for the good old-fashioned carburetor alive and kicking. Sure, it may not be as easy to tune as fuel injection ( if you have a laptop), but we still enjoy doing throttle- chop plug checks and turning fuel screws when we can. What we don’t enjoy is pulling carburetors off five to six times, draining them and replacing main jets after building a motor. It’s tedious, leaves you soaked in gasoline and can often be frustrating. Here’s where Thunder Products comes in. They have been featured in Dirt Wheels many times in their long history of business, and there’s a good reason why-their stuff works. 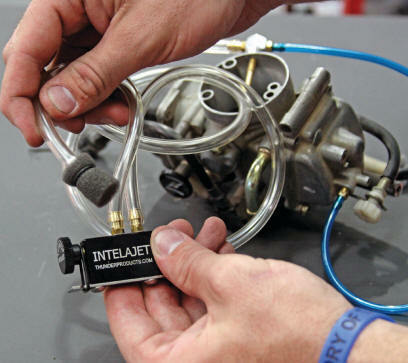 The newest innovation from the brain of engine guru Lonn Peterson is the IntelaJet, which is a fuel metering an injection device that allows you to tune your carburetors fuel level with a knob. 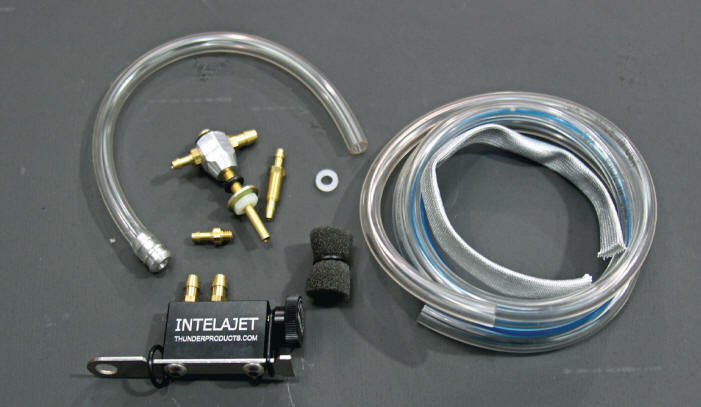 Yes, Thunder Products just made jetting easier than fuel injection. To start off, you need to install the system in one of two ways. The first option is by drilling into the rubber boot between the carburetor and the airbox using the supplied strap mount with the kit. The other option, which Thunder calls the Pro Mount, is drilling and tapping the fuel nozzle directly into the bell of the carburetor. We chose this method for a more solid mount. The #21 drill and tap are available from Thunder Products, so it’s best to just order it when you get the IntelaJet to make sure you have it. 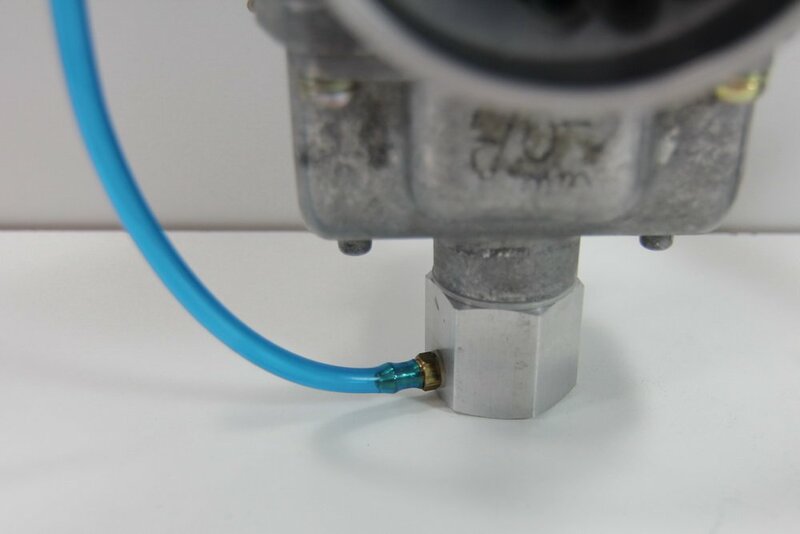 After installing the fuel nozzle per the instructed guidelines (the intelligent has a great instruction manual), you will have to install the fuel supply fitting. On carburetors with the drain plug on the float bowl (non-FCR), you can use the brass fitting that screws again where the drain plug goes and attach the supplied fuel tubing to it. On carburetors with float-bowl nuts, you will have to drill into them as per the kits instructions. 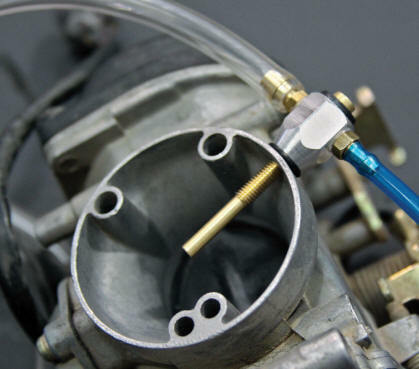 After you run the fuel supply and nozzle, you mount the mixing chamber/adjustment block, preferably close to the carburetor or handlebars, but not on the bars to avoid kinking a line when the bars turn. Start with the block in the center position and two turns out. For this test, we installed the IntelaJet on two machines-and LTZ 400 and a YFZ 450-both with CV-type carburetors. For the white C, we left the jetting stock, installed the intelligent and put our GYTR slip-on exhaust back on the machine to see if the IntelaJet could compensate for the added airflow. When we first started up the YFZ, the pilot circuit was a bit lean, as the IntelaJet focuses on the main jet. We bumped the pilot jet up to sizes, and it idled and ran well on the low-end. We did a few pulls with the IntelaJet in the leanest position, and it coughed, sputtered and wouldn’t rev out, just like a lean condition should. Upon richening up the IntelaJet two and a half turns, the magic started to happen-the added fuel from the fuel nozzle spray got the YFZ near-perfect jetting and also added a power hit that the stock carburetor lacks. Stab the throttle and it goes; it’s quite an amazing difference. We were able to keep the stock main jet and get the YFZ’s jetting very close to perfection, even with the different exhaust system. If we were going to do a full exhaust or airbox mods, we would have to go up one jet size. The beauty of the IntelaJet is its range. You can climb altitude, go down to the beach, ride in any weather, and, with the turn of a knob, you have perfect jetting. It takes a little practice to get it down, but when you do, it’s an awesome product. 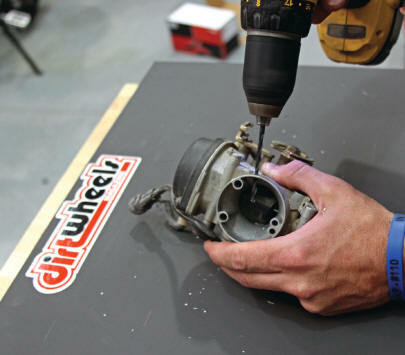 Being able to fine-tune the way your machine runs with the twist of a knob…let’s see a fuel-injected machine do that! 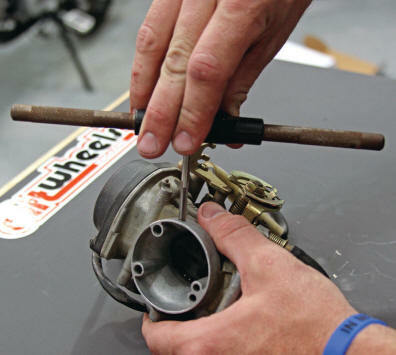 If you’re using the Pro Mount, measure per the instruction booklet and drill through the bell of the carburetor. Use the supplied tap and thread the aluminum hole carefully. After threading the nozzle securely into the carburetor, install the float bowl drain screw adapter and the fuel supply line. Attach the other end of the larger hose to the fuel-mixture module and then run it to the nozzle. When it’s all set up, it will look like this, ready to mount on the frame.